The iPhone Applet Version 2.2 is designed to calculate the additive and the logistic CASUS. The ICU-day is only considered in the logistic version. In contrast to the additive score the logistic CASUS uses ß-coefficients for the calculation. 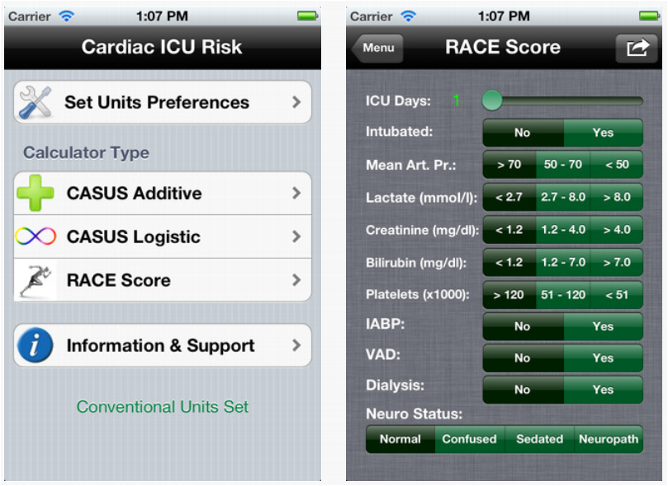 The RACE Score (Rapid Clinical Evaluation) is specially designed for smartphones. Is is also a logistic score, where digital input of data is not necessary. We wish to thank Dr. Edward M. Bender from Saint Francis Medical Center in Cape Girardeau/MO, USA for his realization of an App for iPhone, iPad and iPod touch.